Israel has one of the highest rates of poverty and income inequality in the world. Rather than dealing with their root causes, the primary policy has been to spread an ever increasing social safety net to deal with the symptoms. As a result, income transfers per person in Israel have grown five fold over the past 4 decades while average incomes have only doubled. These rates of increase are unsustainable in the long run. In 1979, roughly one-fourth of the families in Israel would have lived under the poverty line had they not received welfare assistance. Today, approximately one-third of families would live below the poverty line were it not for welfare. However, after welfare and taxes – that is, according to net incomes – about one-fifth of the families then and now live under the poverty line. That, in a nutshell, summarizes what is missing in public debates in Israel and in other Western countries. The primary focus in Israel and abroad is on the extent of poverty and income inequality in net incomes and it misses the underlying trends in gross incomes (i.e. before welfare and taxes) that slip under the public radar. The problem is that the latter reflects the true extent of the issue: a large and growing share of the public is unable to cope in a modern and competitive economy. Once the welfare and tax safety net is spread, it is possible to reduce these rates of poverty and inequality in terms of net incomes – and it is fortunate that such a net exists. But a country that ignores what is happening in gross incomes must spread an ever larger social safety net – i.e. pay more and more money – dealing with the symptoms rather than dealing with the root causes of these problems and reducing them at their source. As the figure indicates, preventing rates of poverty and inequality from rising in net incomes – while they continue their steady multi-decade climb in gross incomes – has translated into steadily rising welfare payments. While per capita incomes in Israel (as reflected by GDP per capita) have doubled since 1970, welfare payments per capita rose almost six-fold by 2001. This balloon burst with the massive wave of terrorism against Israeli civilians – which required substantial defense expenditures above and beyond the regular budgets – and the accompanying deep recession that took a deep bite out of tax income. The result was a substantial drop in welfare payments, and a concomitant rise in poverty and inequality in net incomes – which finally began to reflect what had transpired behind the scenes for decades in gross incomes. 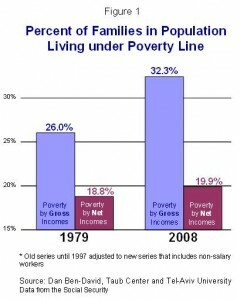 Though welfare budgets per person for 2009 and 2010 are once again expected to rise, and will presumably alleviate much of the rise in poverty and inequality in net incomes, not enough is being done to deal with the primary problems causing poverty and income inequality to be so high in the first place. More to the point, if far-reaching comprehensive policies are not enacted soon to deal with these basic problems, then Israel will be faced with an intractable economic and social dilemma in the future. On the one hand, it is simply not economically sustainable for welfare payments per capita to continue rising during the next four decades as they have over the past four decades. On the other hand, with rates of poverty and inequality in Israel already among the highest in the Western world, non-treatment of the sources of these problems will mean that it will no longer be possible to hide the multi-decade poverty and inequality increases in gross incomes and prevent them from being reflected in net incomes. As one of the other articles (The People of the Book and their Children’s Education) in this e-Bulletin shows, the country’s public policies indicate that the long-run implications of these issues have yet to be fully internalized. The findings on long run trends in poverty and inequality, together with changes in welfare payments over time, will be part of the new macro section in the upcoming Taub Center report on the state of Israel’s society and economy. The primary problems underlying these issues will be detailed in the other sections of the report as well – from the section on employment through to the sections on education and social welfare.